Now that the new Quest Nutrition chips are in stores, I finally got my hands on a couple bags so I could try them out. First up: sea salt and sour cream and cheddar. I’m not a giant chip eater– I really only grab a few chips if there’s a bowl sitting in front of me at a party. Other than that, they are something I could definitely live without (…and pretty much do). Because of this, I didn’t really feel like just eating the protein chips straight out of the bag. Unfortunately Fortunately, I was starving and I needed to throw something together quickly. Quest Nachos it was! Begin by preheating oven to 400 degrees. Empty bag of chips onto a baking sheet lined with foil and spread so they are flat. Sprinkle 1/4 of the cheese over the chips. Spoon meat mixture over top of the chips, spreading evenly. Top with lettuce, tomatoes and the remainder of the cheese. Bake for 10 minutes or until all the cheese is melted. *To cook my meat, I use a cast iron skillet. I add the meat and cover the bottom of the pan with water. I then add spices and cook most of the way, add in extras and cook until no pink remains. I didn’t used to be a big ice cream eater. We always had ice cream in the freezer at my house and I rarely touched it besides a bite here and there. A weird thing happened two years ago when I had mono: I became an ice cream fanatic. Before I even knew I had been plagued with mono for the third (!!) time, I recall NEEDING ice cream one night so badly that I walked to my car, parked far away, in the pouring rain to go to the connivence store. When I got sicker and couldn’t stomach any food a few days later, I made my mom bring me a McDonalds ice cream cone. It was the only thing I wanted to eat. Since that bout of sickness, I LOVE ice cream–both eating and making it. I try not to eat ice cream every day, but with this protein ice cream, I can. Place all ingredients in a blender, starting with 3/4 cup almond milk. Break up ice. Blend continuously until a soft serve consistency forms. If it’s too thick and icy, add a little more almond milk until it becomes the right consistency. Scoop out and top with toppings of your choice (I like peanut butter, chocolate chips, sprinkles and whipped cream). *If you enjoy trying new protein powders, are looking for one, or are ready to change up your normal routine, I highly recommend Royal Sport LTD Whey 100. I have tried and enjoy all of the flavors with the ice cream sandwich being my favorite. I usually experience bad bloating and stomach problems from protein powders and this protein does not cause that reaction. Each serving is only 100 calories and 20 grams of protein which is nice for a snack. The powder also mixes extremely well with water or milk without using a blender for a simple shake. Try it out! Because I missed my Tuesday link-up post, I figured there’s no better time than the present. I’m enjoying Taylor Swifts new song and apparently these guys are too. Did you download IOS8 yet? So far i’m enjoying some of the changes (minus the draining battery). There seems to be lots of new features that may not be so obvious! 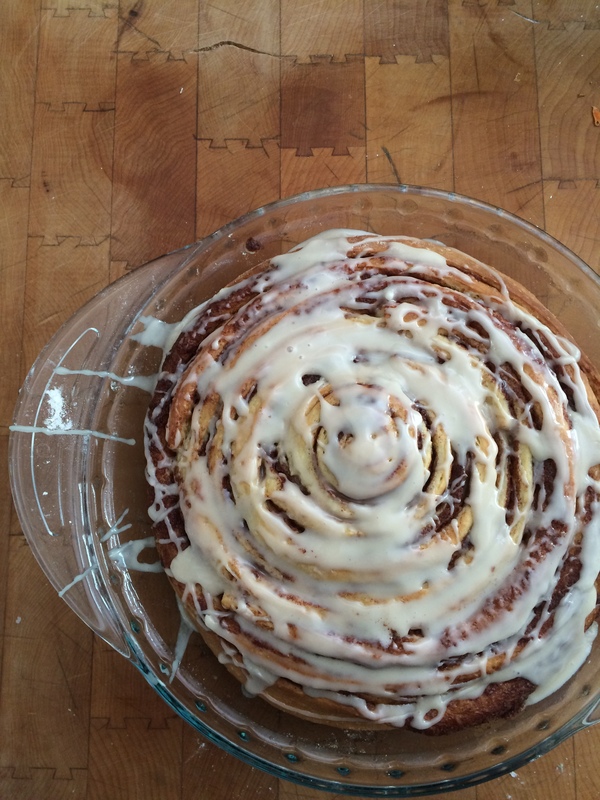 If you feel like baking this weekend, make this bread. I did and it was delicious. This is going to be my next baking adventure. *Updated to add: it’s delicious. Influenster recently sent me the Venus Embrace Sensitive Razor* to try and review. If you’re like me and cut yourself every time you shave, this is the razor for you. Honestly, my legs have never felt so smooth. The handle is light and the size of the razor really allows you to hit all the curves of your legs. The only negative thing I could say about it is that it takes a little more than a quick shove under the shower head to clean the blade between strokes but the quality of the razor more than makes up for it. Also, the little hook that comes with the razor works better than any other one I’ve had. I don’t know what it is, but usually I get back to my shower to find the blade and handle separated on the ground because it fell. Not anymore. *This razor was sent to me free of charge by Influenster in order for me to provide an honest review. All opinions regarding this product are my own. There’s a sushi place near my house that’s All You Can Eat everyday. It’s actually the best restaurant in the area and not just because you can stuff your face with sushi, sashimi and all the accompaniments (seaweed salad and edamame, please) but because everything is fresh, beautiful and absolutely delicious. The only thing about eating there is that you have to be hungry enough to make it worth it. While reasonably priced for lots of special rolls, it’s not exactly cheap for an all-the-time kind of thing. Also, the magical experience doesn’t happen if you don’t eat a few appetizers, eat a few rolls, then maybe decide you’re feelin’ some more miso soup. I was craving sushi the other day but didn’t have anyone to dine with at the time and I wasn’t quite hungry enough anyway. My practical side also reminded me that I had prepped chicken for the week and I needed to save money and eat it. This isn’t so much a recipe as it is a “throw everything together” kind of thing but it works, and it’s delicious so it’s happening. 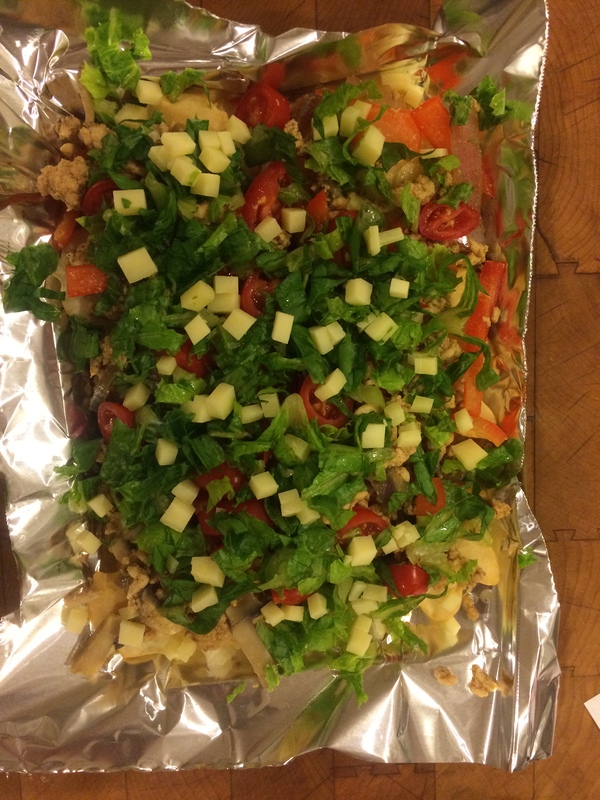 Begin by cutting chicken, onion and celery into small chunks. Place in food processor with mayo and ketchup and process until ground and sticking together (add more mayo/ketchup to taste/consistency if needed). 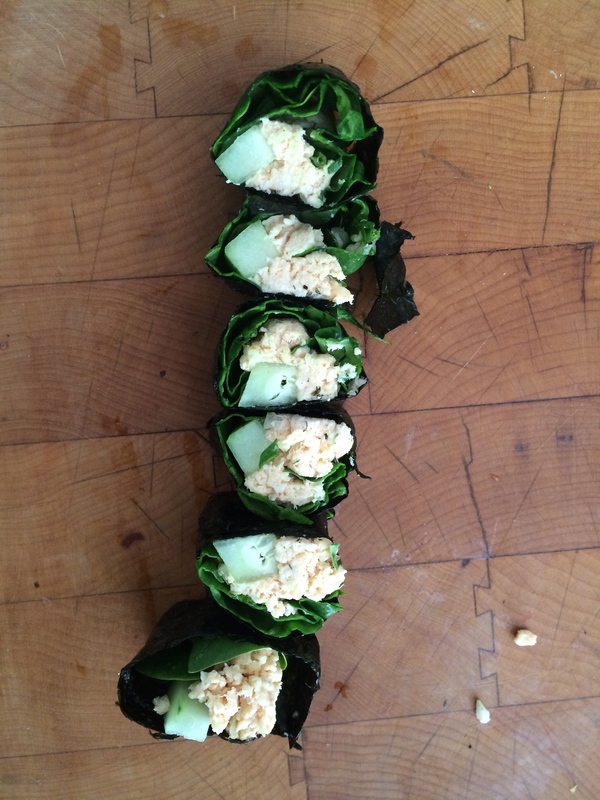 On one sheet of nori, arrange spinach leaves across the sheet about 1 inch from the bottom. Using your fingers or a fork, gently spread chicken salad on top of spinach. Place cucumber sticks on top of chicken salad and press down lightly. Beginning from the bottom, tightly roll nori over the filling and wipe across the sheet with a little water on your finger tip. Continue rolling to the top and seal with a bit of water. Repeat with second sheet of nori. Slice using a sharp, wet knife. *If you cannot find/don’t have hot sauce ketchup, you could probably use a little more mayonnaise and regular hot sauce. I get bored easily. Or, at least when it comes to food I do. Sometimes I just don’t feel like a salad for lunch or a protein/veg/carb plate at dinner. This week, I haven’t even felt like eating oatmeal (gasp!). So, I’ve made it my mission these last few days to simply follow what my mind is telling me and try something new. If eating the same thing every single day gets tiring, trick your mind by just mixing it up! I’ve been dreaming of sushi lately but haven’t gone. Who said that chicken can’t be sushi? 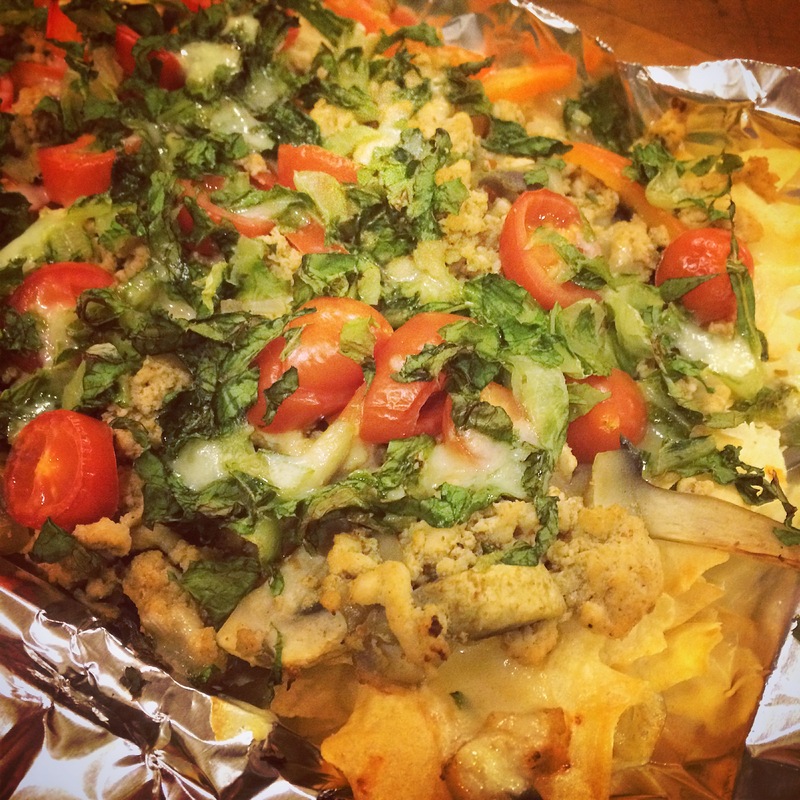 This immediately crushed my craving and was a fun way to eat the chicken I prepped this week. I couldn’t figure out exactly what I wanted for breakfast so I decided to have a bit of everything. 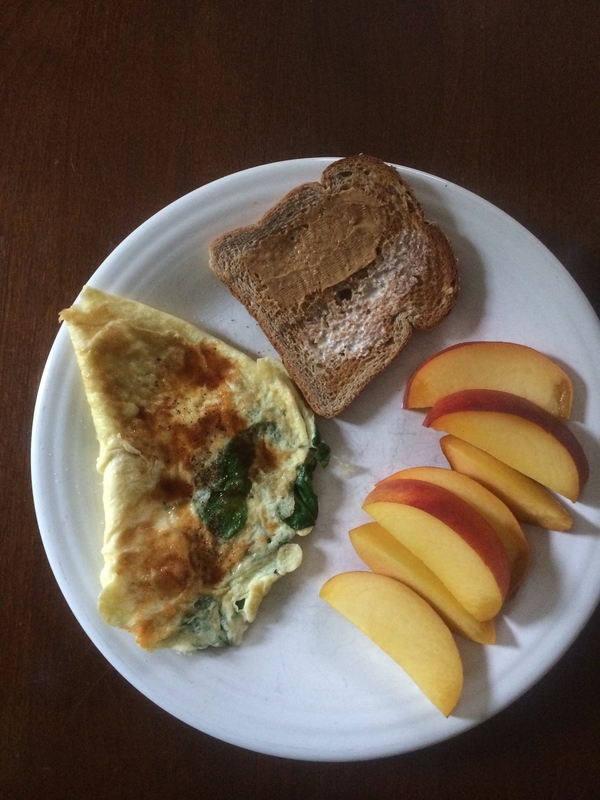 Spinach and tomato omelette, peach, and a piece of low carb toast with half-peanut butter, half coconut oil spread. Sometimes I eat a Greek yogurt bowl for breakfast or a snack with a bunch of mix-ins. Instead, I took all the ingredients, tweaked the ratios a little and made a giant pancake. This made me feel like I was eating something different and kind of extravagant even though it was the same items. *Thanks to Jenn from Peas and Crayons for hosting the weekly linkup! Have you made anything different recently? Loving this quick article about being happy with gaining weight. Not about scale progress, about mental progress. This Buzzfeed article on Instagram Food vs. Real Food is perfect. Love it. I don’t think any dessert could be any more perfect than these s’mores cakelettes. Now in my bookmarks bar. Obsessed with this song lately. The lyrics are perfection. I never used to consider myself a pancake person. For some reason, the whole pancake-thing never really did it for me. I was always left unsatisfied, always wanting more, not because I was still hungry, just not thrilled. As I’ve become more of a “foodie,” the idea of different pancakes has intrigued me. You can do almost anything with them–sweet or savory, thick or thin. Big stacks or one big cake. While I never enjoyed drenching my plate in maple syrup, the idea of special sauces on top or in between each fluffy layer is something I think about when planning a new recipe. 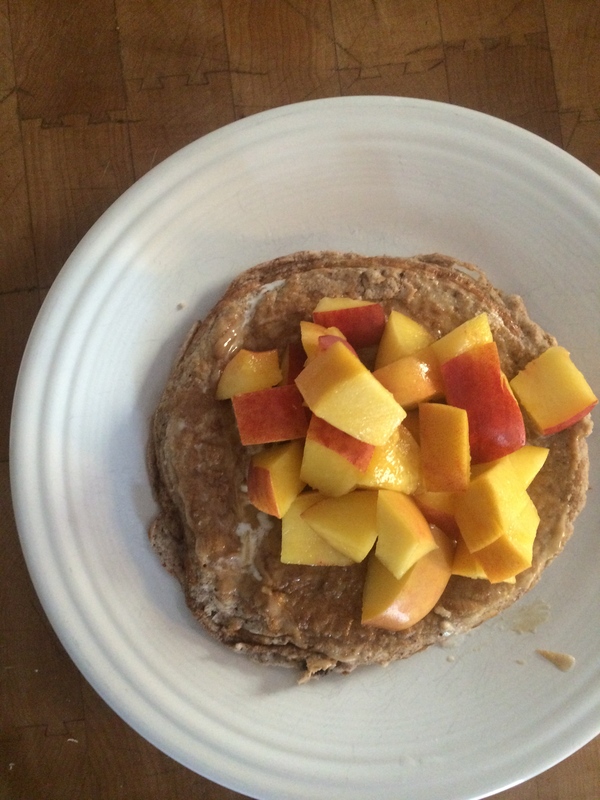 These pancakes are simple, healthy and filling with only a few ingredients and minimal effort. If you follow a dairy-free diet, I would think that the yogurt could be replaced with applesauce or mashed banana–other types of pancakes on their own and definitely worth a try! In a small bowl, make your flax egg and put aside. In another bowl, combine coconut flour, chia seeds, yogurt, egg, vanilla and cinnamon. Mix to combine using a fork. Add coconut milk a little at a time until the batter is thick but can easily be mixed and spooned onto a pan. Ensure all lumps are mixed out. Fold in blueberries and let sit for 2 minutes. While waiting, mix together yogurt, vanilla and peanut flour in a bowl and put to the side. Grease a skillet and place over medium heat. When up to temperature, check consistency of batter. If it has thickened, add a little more coconut milk to get it back to the original consistency. Spoon batter into the pan and spread evenly into a circle. It will not expand or rise. Do not turn until the sides and top begin to cook, then flip. When pancake is cooked completely through, remove from pan. Spoon a dollop (about 1/2 a tablespoon) of peanut butter yogurt onto the top. Repeat with remainder of the batter. Spoon all leftover yogurt over the top of the pancakes and sprinkle with additional berries.